Join Dr. Swann and a number of of distinguished panelists in a discussion on Seniors Care in Alberta. Topics to be covered include: home care, longterm care, assisted living, and more. 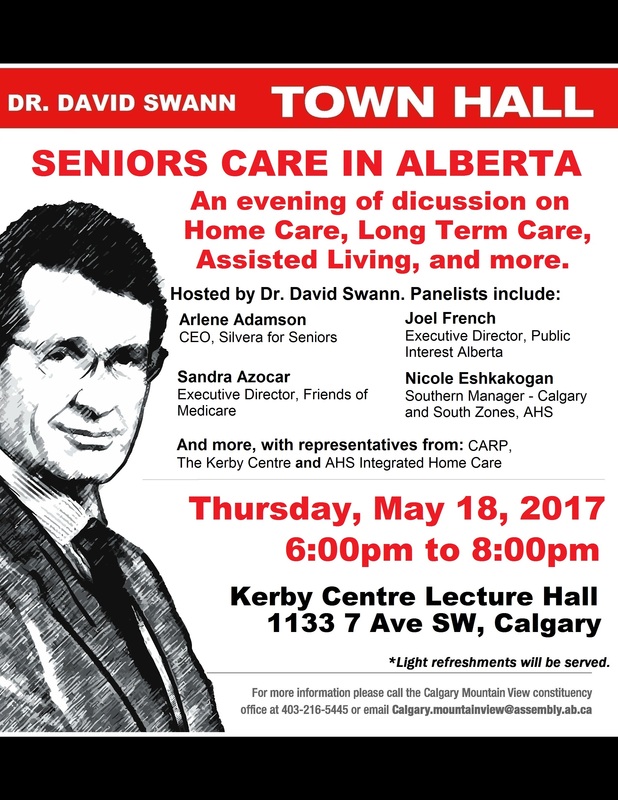 The event will be held Thursday, May 18, 6:00-8:00pm at the Kerby Centre for the 55+, main floor lecture room (1133 7 Ave SW). The Kerby Centre is wheel chair accessible, and can be easily reached by the LRT. Free parking is available in a gravel lot immediate north of the LRT. Please follow the signs to the lecture room. Please note: If you choose to park in the Kerby lot, you must sign in via the tablet computer located at the main floor reception desk to avoid a hefty parking fine.